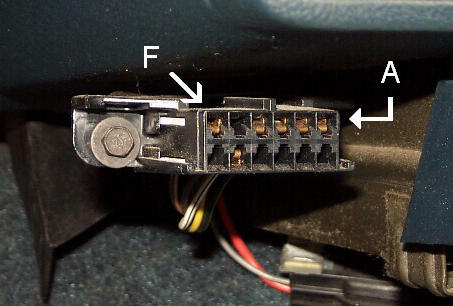 Located under the radio and to the left of the ash tray, is the ALDL (Assembly Line Diagnostic Link). Sometimes also refered to as the ALCL (Assembly Line Communications Link). The ALDL provides an easily accessible link to the ECM. This link can be used to read stored trouble codes, observe ECM and sensor operation or to put the ECM in a different mode for troubleshooting or service. Trouble codes can be retrieved as simply as by shorting an ALDL terminal to ground and counting flashes of the SES lamp. Or with the use of a Scan Tool, which reads the serial data output by the ECM, will allow not only the retrieval of stored trouble codes, but also the provide ability to observe the values each information sensor is sending to the ECM and the desired state of each ECM controlled device. This is the normal mode of operation. In this mode no data will be transmited on the serial data (SES) line. Code 12 will be flashed by the SES light, followed by any stored trouble codes. This is the mode used to set ignition base timing. P/N restrict functions will be disabled. Note: any information available in this mode will only be obtainable by the use of a scan tool. AIR Switching Solenoid (C) This terminal is connected to the Air Switching Solenoid Control Driver. This terminal will be grounded when the Air Switching Solenoid control circuit has been grounded (activated) by the ECM when the proper operating conditions have been meet. This terminal will also be grounded when the key is "ON" and the engine is "OFF". SES Lamp (D) This terminal is connected to the SES Lamp Driver. This terminal is also used for serial data when a Scan Tool is connected to the ALDL. This terminal will also be grounded when the key is "ON" and the engine is "OFF". TCC Solenoid (F) This terminal is connected to the TCC Solenoid Control Driver. This terminal will be grounded when the TCC Solenoid control circuit has been grounded (activated) by the ECM. This terminal will also be grounded when the key is "ON" and the engine is "OFF". EGR Solenoid (H) This terminal is connected to the EGR Solenoid Control Driver. Serial Data from the ECM is transmited using the SES driver circuit. When placed into either ALDL or Backup mode, the ECM strobes the SES driver to output data at a rate of 160 baud or 160 bits per second. Every data packet is 20 bytes (25 bytes for '88), or 160 bits, and when overhead is included, takes about 1.25 seconds to transmit.